Walking deeper into the German part of Switzerland, the architecture shifts a bit, closer to a traditional sense of Swiss structures. Today we had a chance to see up close a number of the traditional barn/houses which are incredible buildings. Built on a one-story masonry base usually containing animal stalls, the timber-frame part risesup three or more stories above. The volume is remarkable, all made possible by traditional timber-framing techniques. A bent is a single slice of a building frame made up of upright heavy timbers supporting multiple stories of other timbers ultimately tied to a set of roof rafters. Building a barn involves arranging a row of these bents, set about 16 ft apart, forming anywhere from three to six (or more) bays which are sheathed on the outside and finished on the inside for whatever purpose necessary. 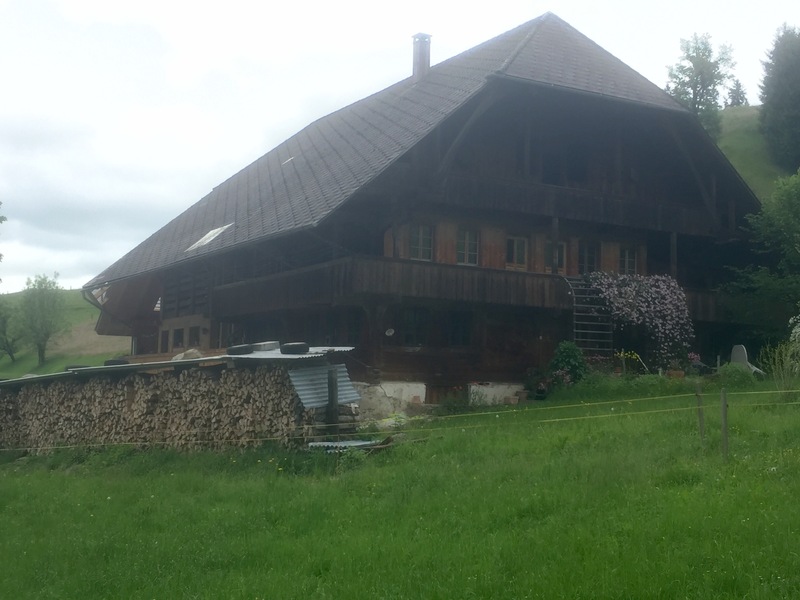 The Swiss barn will include two or more bays finished out to form the family living area (though the top floor might still be part of the traditional barn loft and store hay and tools). The remaining bays serve as the barn, including machine storage, animal stalls, milking parlor, and feed lofts. A model of flexible efficiency, the bents/bays can be transformed into additional living space or a workshop, more animal space, whatever. To live there requires a general disregard for the barnyard smells, but usually the family end is a model of neatness and care. We spent much of the day, which threatened rain constantly, passing from one farm and barnyard to the next. My New Zealand hike prepared me for barnyard smells, though Bennett is only just now adjusting. A farming invention of recent times, a replacement for the “turd hearse” (manure spreader) of my youth, is a pump that moves liquefied manure through a hose with a spray nozzle on the back of a circling tractor. We almost had to cross the nozzle path once which is, and is not at all, like going past a lawn sprinkler. Once again our morning hike was along a river before turning up to climb a ridge. Today the river was regularly damed with structures both old and new. Give the size of the river and the sound of the water rushing past the dam, I was regularly reminded of Burnshire’s dam on the Shenandoah River where I grew up. It’s fascinating how a particular sound–the falling of water at that rate and regularity–can trigger deep and poignant memory.